The 3rd Annual UDI Conference took place in Baltimore, MD on September 19-20, 2013 and Sparta Systems was one of the sponsors for this event. During this conference, Jay Crawley, UDI administrator revealed that the Final Rule has been issued and published in the Federal Register, and will be available on Sept 24. The clock is now ticking for implementation, first for the Class III manufacturers, then for Class II and finally Class I. There had been some changes from the proposed final rule, and some clarifications. One of the major changes is the date format (from MM-DD-YYYY to YYYY-MM-DD). Most of the changes are related to numbering, scanning and labeling. There were also clarifications on product marking and specifics on Product information and device information that goes on the label. While these specifics are meant to improve patient safety and product recalls, it was noted that medical devices are the only products on the market that could not be uniquely identified. The UDI information will be stored in a publicly accessible database to help regulators, doctors and companies monitor safety issues with the devices. From the patient side, doctors, hospitals and insurers will be able to add the codes to patients’ medical records (electronic health record), helping them to quickly identify consumers who have received problematic implants and devices. 1. Production of device identification (DI) codes by Accredited agencies - three Issuing Agencies are accredited: GS1, HIBCC and ICCBBA. 2. Identify database to store UDI data - this is the responsibility of medical device manufacturer (MDM) group -data quality is important here. 3. Assign unique codes to all items - this is the responsibility of the MDM/product group. 6. Communication with FDA's GUDID (Global UDI Database) - this is where TrackWise comes in. The figure below illustrates the UDI lifecycle. The eSubmission tool manages the gather-package-submit process of the UDI data to GUDID (pronounced good-ID) according to the UDI data specifications and HL7 schema. Think of this solution as the UDI data life cycle manager. Step 6 is where TrackWise UDI eSubmissions Manager plays a role using existing technology in other regulatory submissions to the FDA’s AS2 Gateway, making this a low risk solution. The bonus is having the capability to link to other quality processes in the Quality Management System (QMS) platform. 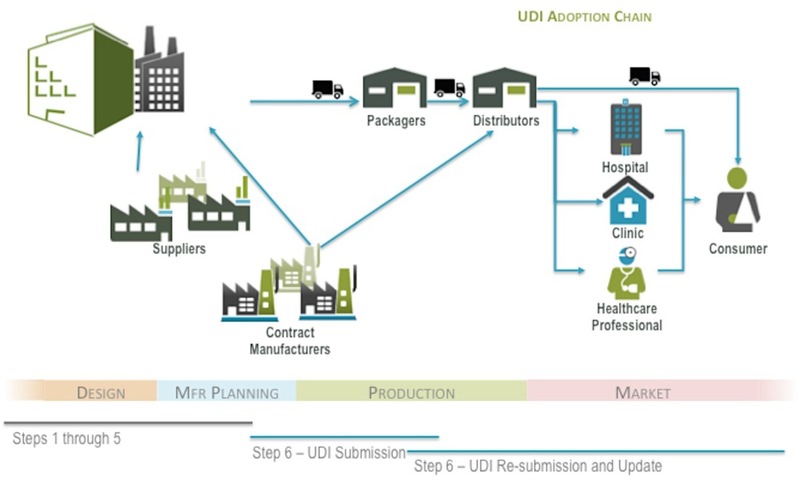 Think about the value and benefits from the ability to initiate UDI update submissions from the Change Control process, Registration Tracking process or other Submission events. International Medical Device Regulators Forum (IMDRF) is working on a similar system as the US FDA UDI Final Rule, with the US, IMDRF and EC working together to make sure the proposals are harmonized because it is not going to help any particular regulator if the information cannot be exchanged throughout the world. Several other countries and regions are also looking to implement a UDI system. The IMDRF includes representation from US, EC, China, Japan, Canada and others. Regulatory Focus also notes that the specific information contained within the UDI will also depend on the risk of the medical device in question. For Class I (low risk) medical devices, the UDI's production identifier will need to include the expiration date and/or manufacturing date. Class II (a/b) devices will need to include lot and batch numbers. Class III (high-risk) devices will need to include batch/lot numbers or a serial number. Lower-risk devices can include more information than is necessary, such as that required for a Class III device, but high-risk devices cannot include less than is required. The same identifier must be affixed to "every packing level for all classes of devices." All information should be provided to the EU-wide UDI Database created using XML format, similar to the US GUDID. Timing is unknown at this time, so stay tuned.